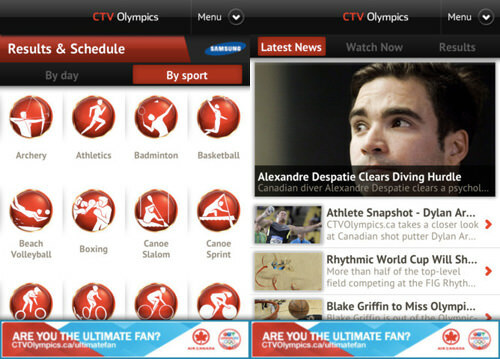 Want all the latest about the Olympics even when you’re on the go? If you have a smartphone, you can. All you need is an app that gives you all the details as they happen. It’s like having the Olympics in your pocket! Get the latest medal tally, overall ranking of each participating country, video highlights of each event, or even updates according to your favorite athlete or event. There are also other features included such as reminders which can be set in local time so you don’t miss your favorite event, venue information for each sport, game schedules in detail, country info, team and individual athlete profiles, photos and more. Can’t be in London for the Olympics? Not a problem anymore. With these apps, it’s like you’re there! 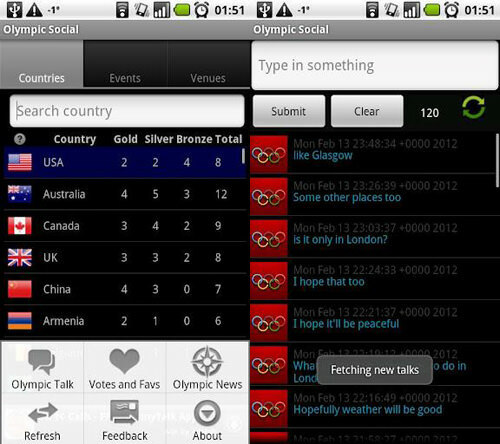 Official London 2012 is the official result app for the Olympic Game. It provides the most up-to-date news, results, medal tables, athlete profiles, details of sports, latest events and games schedules for the 36 sports played on the Olympics. Users are able to receive updates of selected countries, and set up notifications and alerts to keep updated with the latest news throughout the Games. Want updates to come in as they happen? Then this app may help. News, videos, photos of your favorite athletes; real-time results, schedules and medal counts for each sport as well as TV & Online listings, find them all here. Allow Push notifications and you can also get breaking news, results and programming reminders for your team. If you’re just interested in the highlights of the games, the scoreboards and breaking news then this app would be better suited for you. Get up-to-the-minute breaking news and results, as well as video highlights and overall results for every Olympic event as they roll in. Go for gold with this Olympic Medal Alert app which will tell you instantly when an Olympic medal is won in your favourite sports, be it your favorite athlete or team that you follow. Choose the events that you are interested to keep up-to-date in and you will receive details, sms and text alerts whenever the event takes place. You will also get the most recent results with this apps. 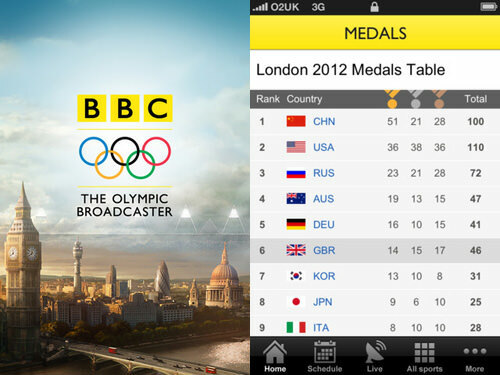 Main broadcaster for the London Olympics, BBC also has an Olympic app which allows you to watch up to 24 live streams of Olympic action. Don’t want the whole thing? Then, just catch the key highlights and crowning moment for each sport. You will also get the medals table and detailed schedule for each event happening in the Olympic games. Here’s one just for Android users. Follow your favorite countries and get updated when they win or lose. See complete event schedules for participating countries adjusted in local time. You also get the medal count for all the countries, plus latest rankings. Want a more detail metal count? 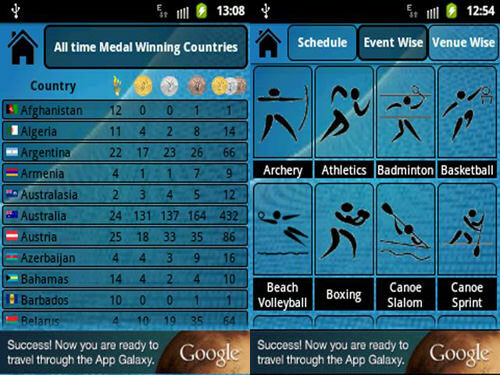 Get this Medals 2012 app which breaks down the number of gold, silver and bronze medals each country has won. You can also catch the time and date for every event Final there is in the games. Don’t miss a single medal. Get the Olympic schedules in your Calendar. 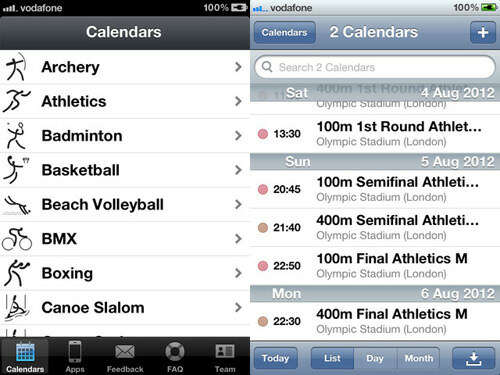 Add Olympic schedules including live results to your iPhone calendar so you’re always up to date during London 2012. 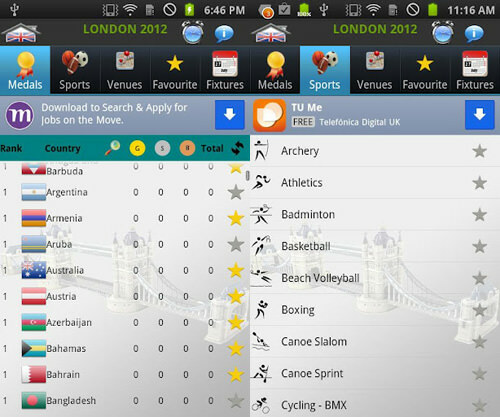 You can add the schedules by sport, country or even athlete. 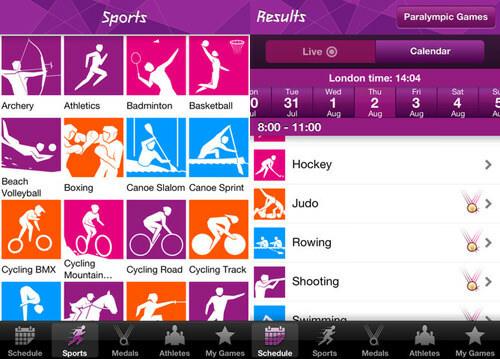 Loaded with features like Schedule, Sports played, Countries, Venues, Daily updates, NEWS, Reminder and much more, London 2012 is supported in 11 languages. 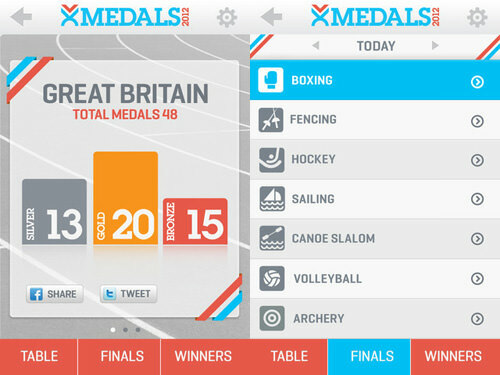 Get the latest medal tally updates together with a countdown ticker. Set reminders for your favorite events with this app too. 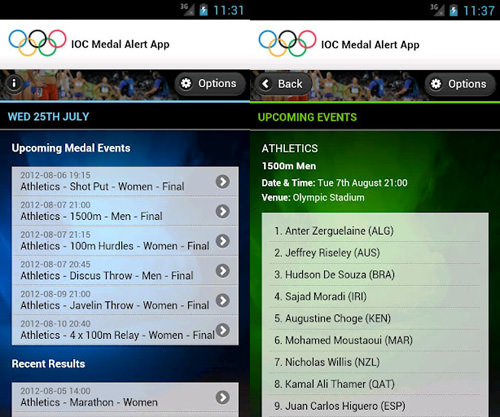 This app is Facebook, Twitter and G+ integrated, gives you schedule (by Date, Event and Venue), news, medal tally, country info, live medal count and other Olympic updates. You can also set reminders for events in local time.